Hair Fair is here! I found a couple of favorites, but there’s so much more hair that I haven’t seen yet! I’m wearing LeLutka / Monso / Exile / and Wasabi Pills. My friend Aemeth will cover hair fair later with some of her favorite finds from Hair Fair, so be sure to check back for her post. 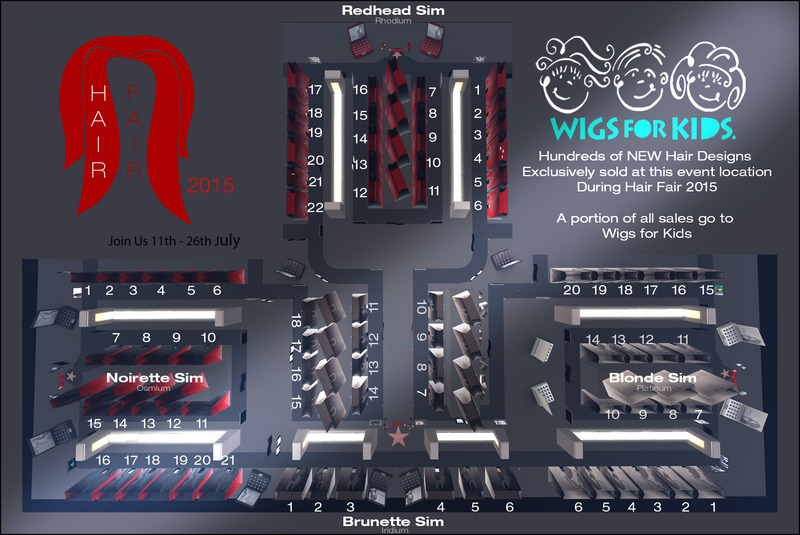 Hair Fair runs from July 11th – July 26th, some of the proceeds are donated to the Wigs for Kids charity, so be sure to visit and support a good cause and buy fabulous hair! SLurls and more info below the cut! We also have two additional sims for the opening days, so that people can TP to them and use them as a way to get into the adjoining sims, or camera shop from them. Stores that have Mens hair included in their release will be shown with a * Many styles however are able to be worn by males, and vice versa, so use the demo group as a way to try everything in advance. The following is the same list but in alphabetical order to find the stores you are familiar with. There are slurls included, but the sims have landing points, so they will only show you with beacons where the store is, not tp you to them.